Q: The Alibi Club is such a complex blend of fact and fiction. What inspired the book? A: Oddly enough, the play Copenhagen, by Michael Frayn. It turns on the idea of uncertainty—in physics as well as life. Werner Heisenberg, Hitler’s atomic guru, travels to Copenhagen to meet with his beloved friend and mentor, Nobel Laureate Niels Bohr, in the middle of World War II—and nothing in their lives is ever the same. Some historians believe that Heisenberg went to Copenhagen to ask Bohr for help in building an atomic bomb—Denmark was occupied by the Nazis at the time, and Bohr was half-Jewish. Others say Heisenberg merely asked him NOT to build the bomb for the Allies. Whatever the truth of the conversation, their friendship was broken forever; a bomb was built and dropped on Hiroshima—but what exactly did they talk about? Nobody knows. I found the story so compelling I went back to the book Frayn tapped for his play, Thomas Powers’s Heisenberg’s War. And in reading it, I stumbled across the story of Frederic Joliot-Curie. Q: He’s the French physicist who has the beginnings of an atomic bomb in your story? A: And in actual fact. Yes—Fred Joliot, Marie Curie’s son-in-law and a Nobel Laureate himself, had the initial plans for a nuclear pile—the basis of a chain reaction; he had the only cyclotron in Europe at his lab in Paris; and he was foresighted enough to know that the Nazis would be coming for both. Q: So he made sure nothing was available when they arrived, in June 1940. A: Exactly. It’s such a fabulous story—a bunch of complete amateurs with only the sketchiest idea of physics, organizing around the problem of getting heavy water and radioactive uranium out of Paris just as the Germans are marching in. I’d never realized Joliot-Curie existed, much less kept the components of the world’s first atomic bomb from falling into Hitler’s hands. I wondered why I’d never heard the story before—and then I realized: Because he didn’t build The Bomb. We did. And victors write the history. Q: So you wrote Fred’s story instead—with embellishments. Like Memphis Jones. A: Ah, Memphis. She’s a complete rip-off of Josephine Baker, of course—the most beautiful African-American woman in Paris, hated by the Nazis, named as a “degenerate” in their attack on the art of jazz, and a volunteer spy for the French Resistance. Baker—and Memphis, her alter ego—is tailor-made for spy fiction. I thoroughly enjoyed living in her head for as long as I could—she’s a marvelous character. Q: The book is filled with marvelous characters. A: And some of them were real. Spatz, for example, the German spy embedded in Paris—he went on to be the wartime lover of Coco Chanel, the greatest French designer of the twentieth century. She was exiled for collaboration as a result, and had to leave France for nearly a decade. Q: One of the pivotal subplots of The Alibi Club revolves around the New York law firm of Sullivan & Cromwell. 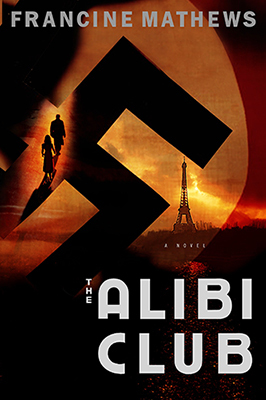 A: And its Paris office, a major player in The Alibi Club. The murder of Philip Stilwell is fiction, but the substance behind it is not. Sullivan & Cromwell was run by Foster Dulles, the highest paid lawyer in the world in 1939. He was totally against American involvement in World War II, contributed to Lindbergh’s America First movement, and represented a number of German clients until his partners forced him to close the Berlin office in 1935. Q: One of them being a company called I.G. Farbenindustrie? A: Which created Zyklon B, the strychnine gas employed at Auschwitz. I found it ironic that an American law firm had historic ties to one of the agents of the Holocaust. As long as the United States maintained its neutrality, business was conducted as usual—whether you were a Nazi, or fighting them. Foster Dulles’s brother was Allen Dulles—another Sullivan & Cromwell partner—but Allen was a confirmed internationalist violently opposed to Foster’s views. They used to duke it out in Op-Ed pieces for the New York Times. Allen quit the firm and helped found the OSS—Roosevelt’s Office of Strategic Services. He ran a spy network from Switzerland for most of the war, and went on to direct the CIA into the Kennedy Administration. I found the dynamic between the two brothers told me something about America’s divided soul, as the Germans marched into Paris; and that became a framework for part of the story. Q: Who’s your favorite person in the book? A: That’s hard. I’d probably have to say Nell, the Englishwoman attempting to run a vineyard in Bordeaux. I think I love her because she’s never a black-and-white actor—Nell’s motives and morals are always firmly in the gray. That suggests complexity to me. And complexity is always far more engaging than its alternative.